Obesity is a disease with a mortality rate proportional to the degree of overweight. The larger it is, the more serious consequences are. The example "a" fit in the diagnosis of morbid obesity, while the example "b" is a person of normal weight. Note: the above formula does not apply to people with large muscle mass, because it tends to fit them into the category of overweight or even obese, even with low percentage of body fat. 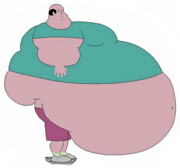 There are 1.6 billion overweight and 400 million obese people in the world today. The main cause is the sedentary lifestyle combined with a diet rich in calories. Only a very small percentage of the obese has some disease that predisposes them to such a situation. Importantly, there is no difference between gaining weight and becoming obese. You cannot put the blame for a BMI of 35 kg/m2 in the drugs described above. All people with a BMI greater than 25 kg / m2 should measure their waist circumference. Men and women, whose waist circumference is greater than 102 cm and 88 cm respectively, have a higher risk of developing diseases related to obesity. The so-called central obesity is what brings the greatest risk of cardiovascular disease and early death. People with fat accumulation in the abdominal region are called visceral fat, which is the excess of it around the organs. The accumulation of fat predominantly in the thighs and hips presents less risk because it has less involvement of internal organs. The apple-shaped body is versus pear-shaped body. Another way to evaluate central obesity is through the relationship between the length of the waist and hips. Values greater than 1 in men and 0.8 in women indicates a higher risk of diseases related to obesity. From 35 kg / m2 these measures lose value since everything has a higher incidence of disease. One consequence is the development of metabolic syndrome, also called syndrome x.
Obese people and / or carriers of the metabolic syndrome are at higher risk of developing diabetes and cardiovascular disease. People who are overweight have a higher morbidity (presence of associated diseases) and higher mortality than people with normal weight. The mere presence of overweight is enough to reduce life expectancy. The death risk is 3 times higher in obese than for people with normal BMI. Contrary to what one might think, adipose tissue (fat) is not simply an inactive bunch fat. It's actually a metabolically active tissue producing enzymes that cause resistance to insulin function, increased blood pressure, increased cholesterol deposits in blood vessels and other actions that raise the morbidity of obese patients.